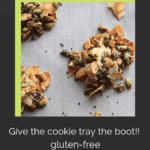 Coconut Seed Clusters may give the cookie tray the boot! 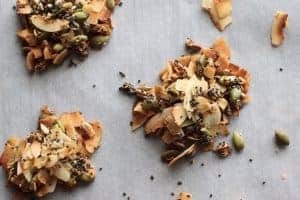 Healthy fats, protein, and fiber from seeds with natural sweetness from honey and coconut make these healthy snacks YUM! Candy at the front desk, Girl Scout cookies in the break room, and birthday cake at 3:00 to celebrate the honoree. The office can be the death of a health goal. These tempting treats are a minefield that can wallop willpower and derail good intentions. So what can you do? Rather than a candy dish, greet visitors with a pitcher of cold water infused with strawberries, apples, cucumbers or pineapple. The office staff might adopt a monthly birthday, celebrating all the birthdays in the month on the first day of the month rather than every day there is a birthday. You could save your extra calories for the treats you enjoy most. Don’t waste your time on jellybeans, if you prefer a little chocolate. Or if someone in your office is a great cook, say yes to those and no to the doughnuts. A “something now, something later” strategy may be a tool to use. 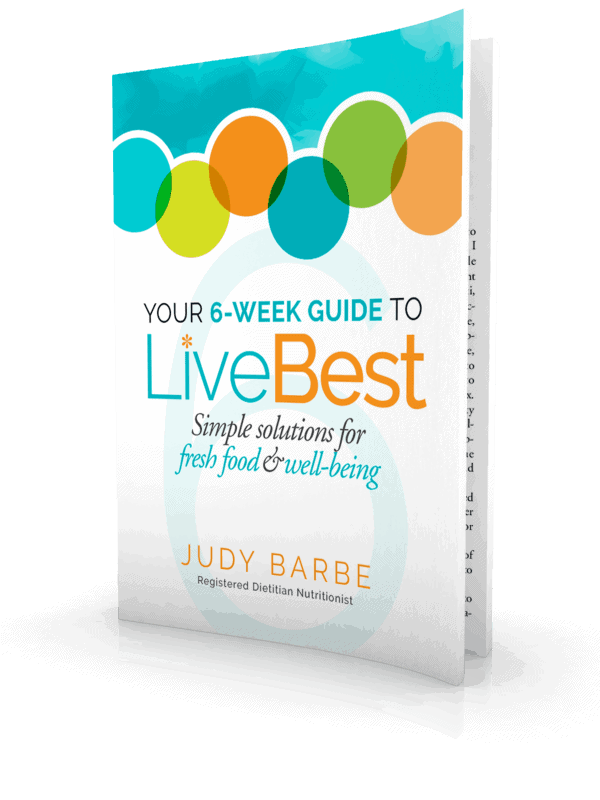 This is especially helpful for those with diabetes. Depending on the carb count, they could divide the sweet to eat some now and some later with afternoon break or even the next day. Downsize the cups and plates. Great for root beer float days because research shows that eating smaller portions of foods satisfies a person just as well as a larger portion. The theory is that once you’ve swallowed something there is not much memory of how much you ate—you just remember, mmm…that tasted good. So take a couple of bites and then move on. After 10 minutes you will likely have lost the desire for more. 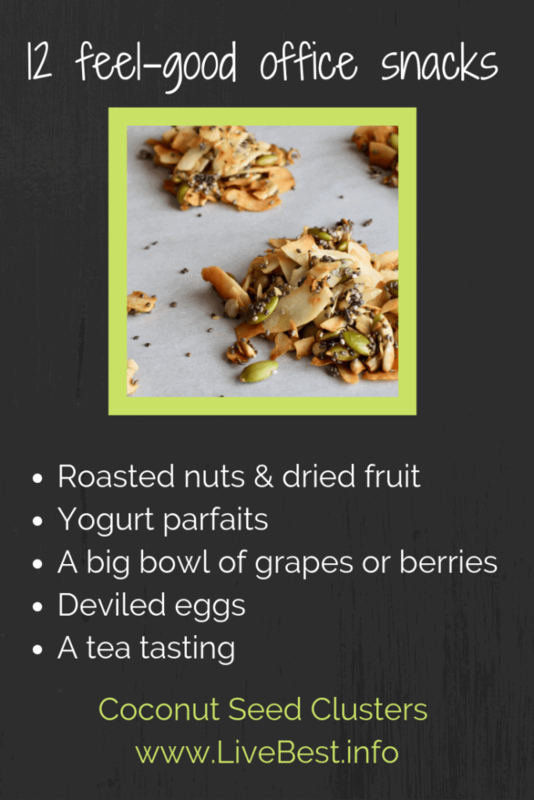 Rather than sweet treat celebrations, consider these healthy snack ideas. 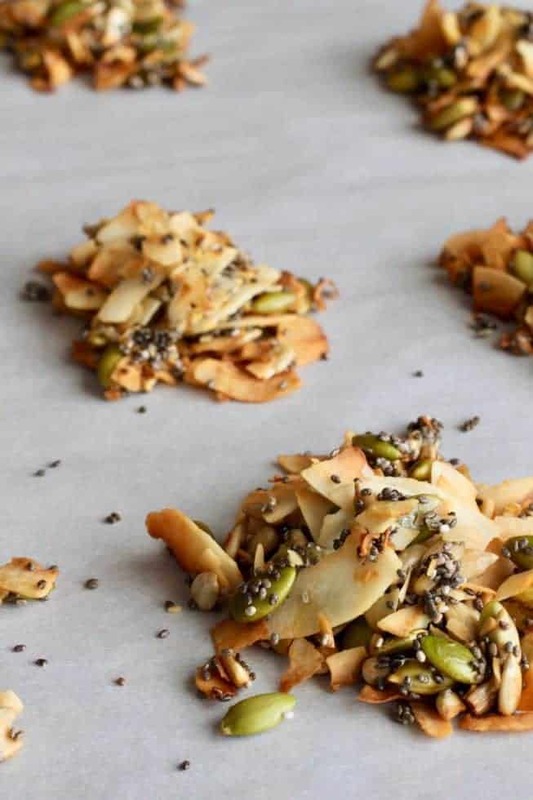 Or try these Coconut Seed Clusters. These are good on their own, or crumbled over oatmeal, yogurt or cottage cheese. 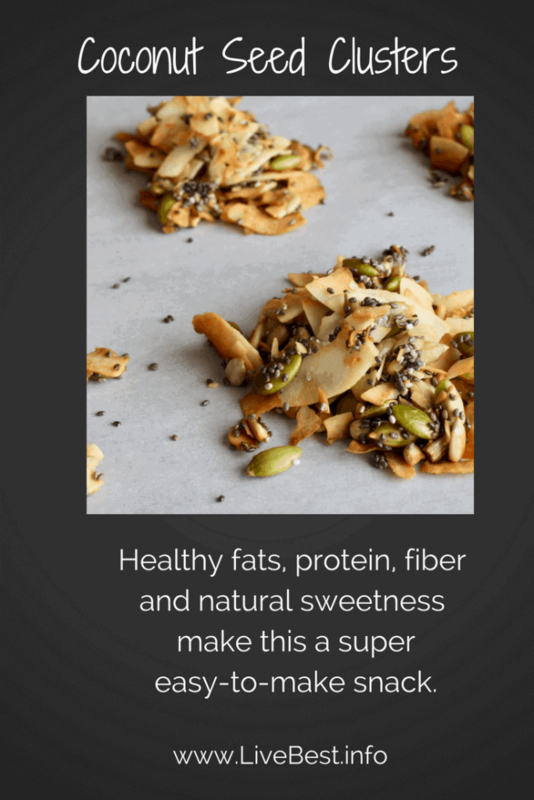 I like the healthy fats, protein, and fiber the seeds provide. The coconut adds natural sweetness. You may not even miss the cookie tray! A nutty, seedy bite with a touch of sweet and salty. Heat: oven to 325 F.
Stir: all the ingredient together until well blended. Spoon: teaspoons of coconut mixture on to baking sheet lined with parchment paper or a baking mat. Bake 13-20 minutes. Until coconut is lightly browned. Remove from oven and set pan on a cooling rack for 10 minutes before removing clusters. These harden as they cool, so if they cool completely, may break when you remove them. These are sooo good! 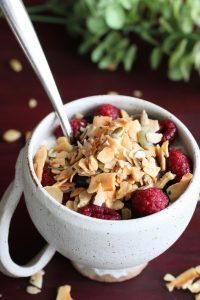 I like them sprinkled over yogurt or cottage cheese with fruit for breakfast. I pack them when I travel. They’re a great afternoon treat. This recipe looks awesome! I need a quick boost at work. 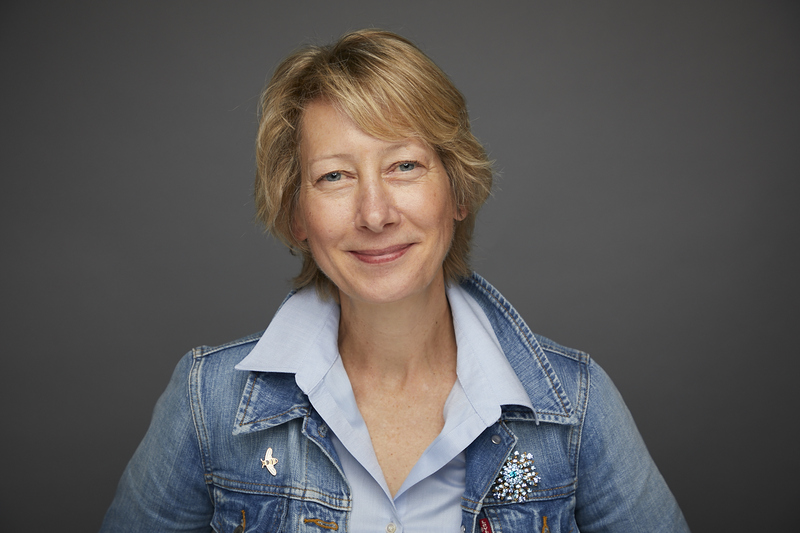 Looking forward to using your website as a resource to help control type 2 Diabetes and weight. How do I get the nutrition values? Thanks, Sue. 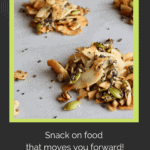 I love this recipe and even take them as a snack when I travel. The recipes I develop use better-for-you ingredients with the intent of nudging people toward eating more of these foods. Because of that, I don’t do nutrient analysis on recipes. You raise a good point with diabetes, so will consider it in the future. I am diabetic and am using this recipe with alterations. I don’t exactly measure ingredients but you will get the idea. I use smaller amounts of honey and/or maple syrup, but added Xylitol to the water. 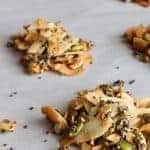 Addition of sliced almonds and a little sesame seeds and hempseed hearts made an excellent mix. 15 minutes was all it needed to cook spread into a 10X15 pan. BTW, I tripled the recipe. Not so sweet as the Coconut bites from Creative Snacks. Could you use Swerve instead of Honey to make this Keto Adaptive? Yes, you can omit the salt. I use it to boost flavor but it will be fine without.